Hello, Friends. Ben Blair is out of town this weekend. I miss him like crazy! While he is gone, the kids and I will keep working on the sibling Christmas gifts and we’ll get the tree decorated too. Hopefully, I’ll have some fun ideas to share next week. What about you? Any interesting plans? – A stripey playroom photo tour. – Cafe Johnsonia is back. Hooray! 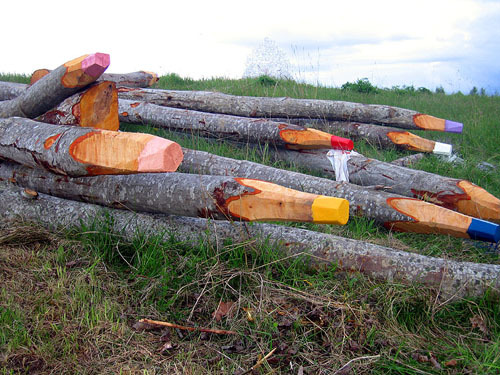 – It makes me happy that someone thought to make logs into giant pencils. – Mesmorized by these string installations. – Visual history of the coca cola bottle. – Cute last-minute advent calendar. – Do you keep old maps? You could make this. – The closet-as-headboard is my favorite part. – I want to put these in my kids’ stockings this year. – So simple, but I’m kind of obsessing over them. – These are hilarious. Baron of Beef might be my favorite. – It’s called a Fisticup and it made me smile. – A favorite childhood memory, choreographing dances to this. – Modern and unfussy at the same time. Holiday Giveaway Week has been so much fun. I’ve loved reading your comments and hearing your enthusiasm. Thank you for joining in. Giveaway #5 will remain open till Monday, and the Facebook contest is open as well — feel free to participate! Have a great weekend and I’ll meet you back here on Monday. I miss you already. oooh, love that antonia calendar. thanks for the link! have a great weekend with the kids! I can’t wait to see the finished sibling projects! Loving that playroom! Such great decorating ideas. We’re having the kids make gifts for each other this year as well, for each other and cousins. Do you have any good idea’s for a craft a couple five year olds can make? We’re having our anniversary dinner and just found out from facebook that the kids are taking us out to dinner…!! Yippee! Silly question, but how do you work on sibling gifts without the others knowing what you are making? Especially with hubby out of town? Thats just the way my brain works…always wondering things! Oh, man. We choreographed dances to Mannheim Steamroller’s Fresh Aire Christmas also. Definitely a favorite childhood memory. Thanks for your blog. I’ve been a big fan for a while now! love the clothes headboard…i don’t think my clothes are as pretty as hers though. Seeing that playroom made me remember our sweet Little People Family House! I want one for my girls now. I ordered one of those Tapis for my kids to use. The bright colors were all gone so I settled for steel wool. Still, very excited not to have to buy anymore of those small disposable bathroom cups! Hope you have a great weekend! I can’t wait to see the sibling gifts you worked on. I’m still trying to come up with gift ideas for my family. Loving everything on the blog lately! I said it once and I will say it again! YOU ARE AMAZING! Have a great week and I loved this list, amazing things on there! Your giant colored pencil made me really happy. Thanks. Im wondering the same thing, how in the heck do you get the kids to make sibling gifts without everyone knowing what they are making? I only have two kids and I dont know how I would accomplish that!